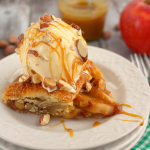 Easy as pie, this Dutch Apple Tart is an even easier version of the classic pie recipe! 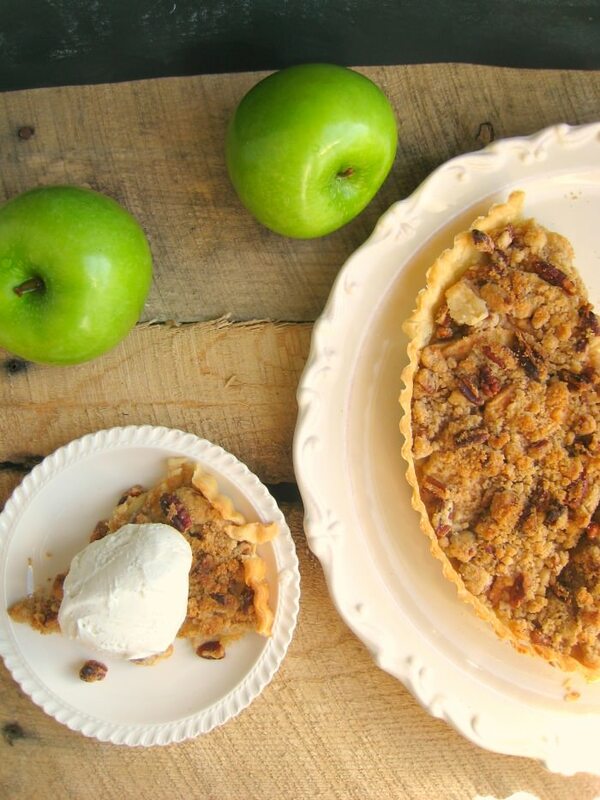 Sweet, tender apples, and a brown sugar cinnamon pecan crumble are baked to perfection making this tart a perfect addition to your holiday dessert table! Fantastic for Thanksgiving and Christmas dinner! Are you thinking about Thanksgiving yet? I definitely am, as this is quite possibly one of our favorite holidays – great food, college football, some good wine. We have much to be thankful for, and this year is no exception. I will be hosting a few family members, and making the meal again this year. Since we live quite far from pretty much all of our family, we only get the chance to see them once or twice a year if we’re lucky. As many of you know, making a holiday meal requires preparation and time management. I’ve also come to discover that you don’t have to make it harder that is needs to be. 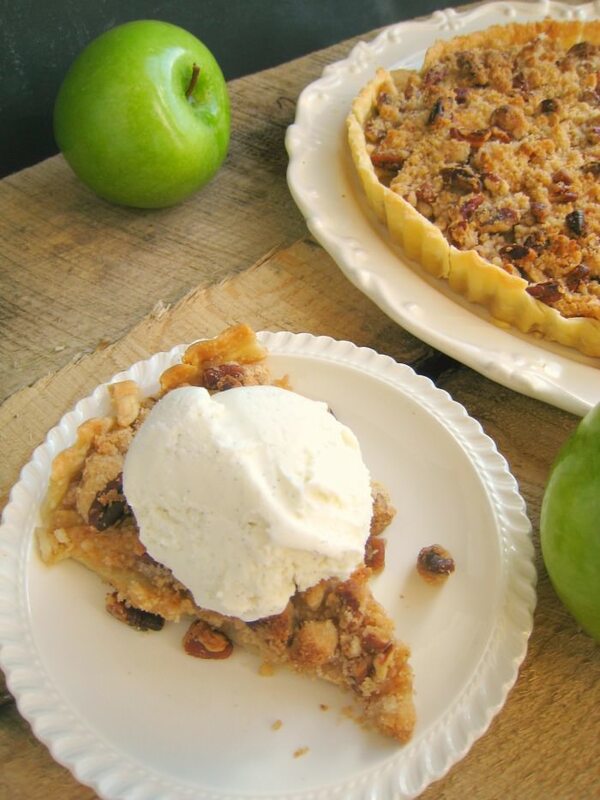 This Dutch Apple Tart with Pecan Crumble is not only a delicious holiday dessert, it is pretty quick and easy to make. It uses a refrigerated pie crust, and just a few other basic grocery store ingredients. It tastes AMAZING! You can make it the night before and set it aside to free up some time and oven space for when you need it Thanksgiving morning. 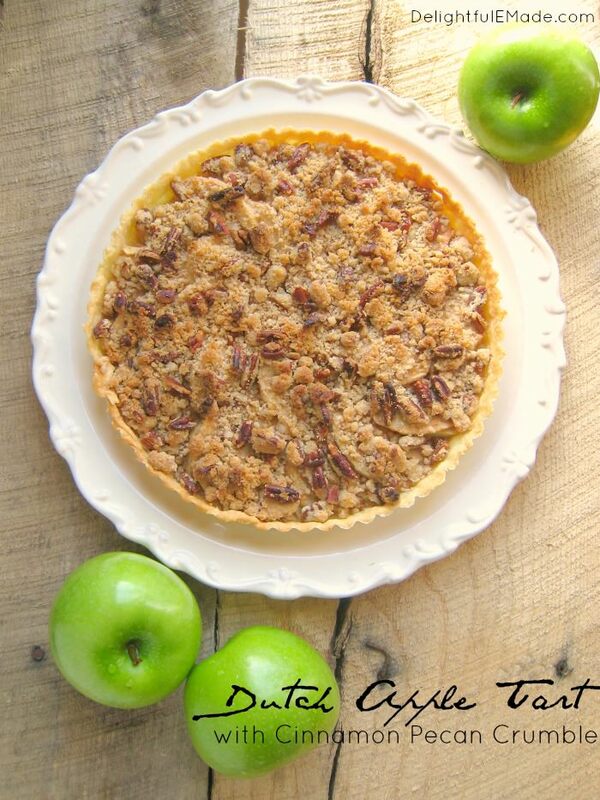 Dutch Apple Tart with Pecan Crumble - the perfect easy Thanksgiving dessert! 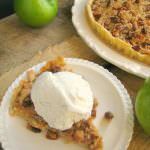 This fabulous dessert combines the flaky crust of a pie and the nutty crunch of an apple crisp for amazing flavor. Top with vanilla ice cream for the perfect holiday dessert! Using a 10" Tart pan, unroll the refrigerated pie crust and lay it into the pan. Press the crust into the scalloped sides, and pinch off any remaining crust. Use excess to fill any holes. Set aside. In a large mixing bowl, add your sliced apples (that have been peeled), along with 1 Tbsp. flour and 1/2 tsp. cinnamon. Gently mix to coat the apples. Set aside. In bowl, mix together flour, sugars, cinnamon, nutmeg and pecans. Gradually pour the melted butter over mixture, and stir with a fork. Mixture will be crumbly. Using the coated apples, lay them in a single layer over the crust. Top with the crumble mixture. Bake on a baking or cookie sheet to prevent any juices from bubbling over. Bake for 23-28 minutes. Crust will be a golden brown. Cool slightly before serving. I hope you give this a try for Thanksgiving, or for any time you need a dessert. It is great with a scoop of vanilla ice cream and a cup of coffee. Thankful for all of the wonderful blessings in our life. May you and your family be blessed as well. This looks great! I love the pecan crumble. I love apple tarts. This is amazing with the pecan crumble. In love!! Pinned. 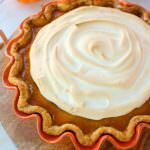 This sounds like the perfect dessert for Thanksgiving! I'm pinning this and I shared it on FB! Thanks for linking up to Freedom Fridays - Have a great weekend! Looks yummy thanks for sharing! Hi, stopping by from Best of the Weekend! This tart looks delish...pinned it. Also following you on Twitter. Have a great weekend. 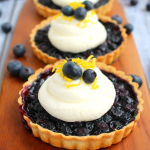 Oh wow, this tart looks amazing!!! What a great fall dessert!!! This would be perfect for Thanksgiving!!!! Looks absolutely delicious!! I don't know if I have the skills to make this dessert but it looks so delish that I think I will have to try it! This tart sounds amazing, Erin! Honestly I've never made one but I think that needs to change! Thanks for the recipe, pinning! 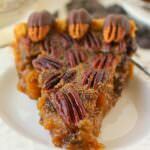 This pie really rocks my world and is featured this week at Freedom Fridays With All My Bloggy Friends!!! Hugs and thanks for sharing! I am slowly getting ready for Thanksgiving! Finally bought the turkey so I headed in the right direction how! 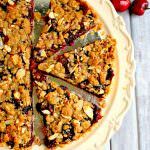 This tart looks wonderful and thanks so much for linking it to Less Laundry More Linking party! This is really delicious looking! Congrats on your feature at BeBetsy! Mine didn't come out well once I made the crumble top, it had wayyyyy too much liquid. Is the amount of butter listed correct? So sorry it didn't turn out. I've double checked the dry ingredients/liquid measurements, and they're correct. If too wet, then yes, you would be correct as there would be too much melted butter. 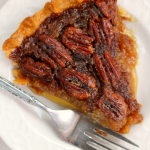 Oh - apples and pecans - a perfect pairing!! Thanks for sharing on the What’s for Dinner link up and don’t forget to leave a comment at the party – Next week’s features that also leave a comment get pinned, yummed and tweeted!